Camsurf is one of the most popular random chat websites of the world which you can meet people from different countries of the world. We are going to introduce this website on How to Chat Online today and we hope that this is going to be a good guideline for you. We will also provide Camsurf app for talk to strangers on iOS and Android devices. Please scroll down to see iOS and Android versions of the application below. If you would like to ask anything about the website, you can leave a comment below. One of our expert staff is going to answer your questions in a few moments. Go the website with the source that we provided you above. The website will ask you to enable microphone and camera. Please allow click on allow. Then click on start to begin to the chat. This is how you can begin to talk to strangers on the website. The website is also free to use and this is very reliable way to make friends through a random chat. It has developed by an Ukrainian developer a few years ago. The website gained popularity soon after it released. It is providing a good service for those who are looking for anonymous chat. 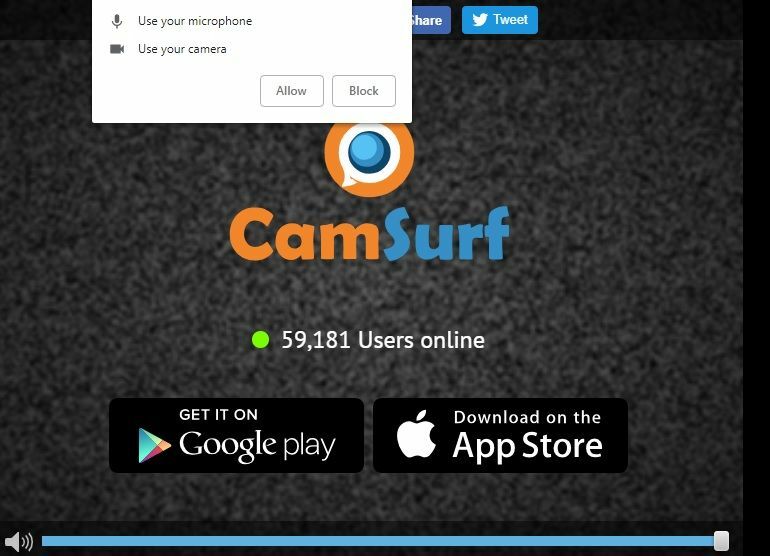 Camsurf online is a random webcam chat service with free cam to cam chat opportunity. You can filter countries on the website and you can also make it random as you wish. Devs are quite strict about the terms. Therefore you can easily get banned if you violate the terms. We recommend you to read terms of the website before you start to use it. After you begin to the chat try talk to strangers. Be kind against them and try to be talkative a little bit. Find an interesting subject to talk about. If you feel that you got bore with stranger click on next button. Begin to talk to stranger on Camsurf. This is how you can skip strangers and talk to people on the website. Ensure that you are not getting reported by others because if you get too much reports, you will be banned from the website automatically. We are also going to tell you how to remove Camsurf ban at incoming pages. So try to behave while your talking to people and also please stay with your clothes. If you are using a mobile device and if you also would like to use the website on your phone with an application, you can see the downloads from play store and app store below. You will able to talk to strangers on Camsurf app too. There is not too much differences with usage of the website and apps. So if you ever experienced PC version of the website, it will be very easy to use the application on your mobile. We provided two mobile versions of the website below for Android and iOS. The application has been installed more than 1 million times on Play Store. Its size is 24 megabyte and it requires Android 4.1 at the least. Overall review points is 3.4 for the application. The bad reviews for the application generally based on removing ban. Camsurf online is also available for iPhone too. You can download it from app store. As we have told for Android app, this is also free for iPhone and iPad devices too. However the application is created in the name of Fruzo. You will also see it when you connect to the application page from the official website of Camsurf. So the application is using the same database with Fruzo at the moment. We recommend you to not to get banned if you don’t want to pay for the application. You can download the application from App Store. The application is available for iOS 9.0 or later operating systems. It is working on iPhone, iPad and iPod touch. You need to be 17 year-old at the least to use the application. The overall rating of iOS users for this app is 3.4/5.